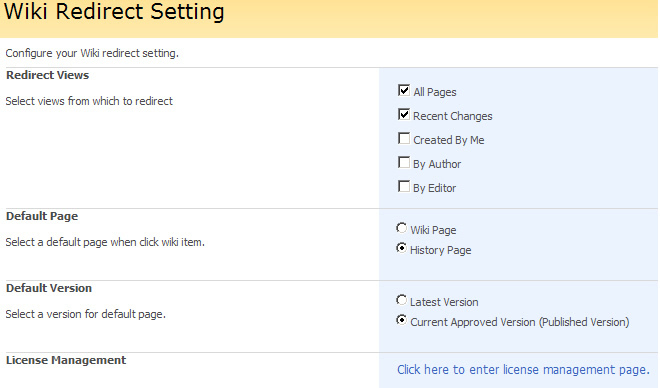 SharePoint Wiki Redirect provides an easy way to manage different versions of wiki pages and control which version is displayed by default. Wiki Redirect gives you the ability to quickly toggle between the version edited most recently, the latest approved/published version, and the version history page, deciding which version will be displayed whenever someone accesses the wiki. ...... setting determines whether the latest version of the wiki or the most recently approved version is displayed as default. If the version history page and the current approved version of the wiki are selected as defaults, the wiki page will automatically open the most recent published version, with a clickable list of other versions available on the left. * Can select views from which to redirect. PDF reDirect is a fast, free, and easy-to-use PDF Creator. Qweas is providing links to SharePoint Wiki Redirect 1.3.111 as a courtesy, and makes no representations regarding SharePoint Wiki Redirect or any other applications or any information related thereto. Any questions, complaints or claims regarding this application SharePoint Wiki Redirect 1.3.111 must be directed to the appropriate software vendor. You may click the publisher link of SharePoint Wiki Redirect on the top of this page to get more details about the vendor.